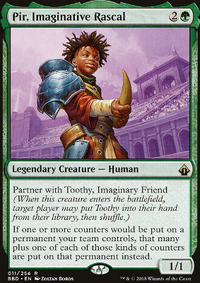 This deck started as a Vorel of the Hull Clade deck, but after seeing Pir, Imaginative Rascal and Toothy, Imaginary Friend in action I couldn't help but make the change. Pir's ability to interact with other forms of counters as well as +1/+1 is seriously strong! I'm still trying some things out with this build, but so far I've been getting great results!